Billionaire by Jacob & Co. is a one-of-a-kind watch with 260 carats of emerald cut diamonds and a price tag of $18 million. Billionaire by Jacob & Co.
Jacob & Co. is a luxury watch and jewellery manufacturer led by Jacob Arabo. Recently the company unveiled the Billionaire watch with 260 carats of emerald cut diamonds and a price tag of a whopping $18 million dollars. This unique watch has been made for and in collaboration with businessman Flavio Briatore. The watch in fact gets its name from Briatore’s haute couture and lifestyle brand Billionaire Lifestyle SARL. While the Billionaire is a limited edition of just one piece, Jacob Arabo has reportedly said that he can create similar pieces using different gemstones. Jacob & Co. has apparently created a world record in terms of carat weight, by setting the Billionaire with 260 carats of diamonds. Each of the perfectly matched emerald-cut diamonds is mounted upon 18K white gold beads, which have been me­ticulously shaped into inverted pyramids. Some of the individual gems apparently weigh up to three carats. 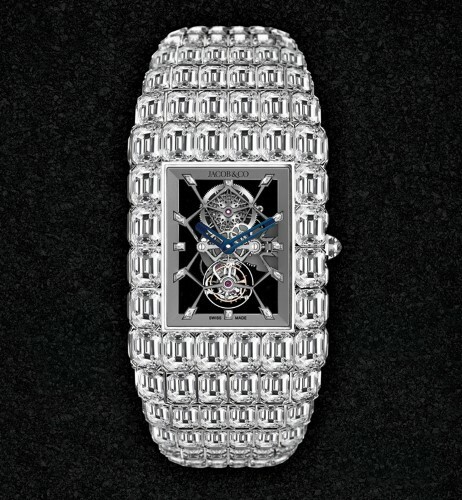 In the midst of all these brilliant diamonds is the skeletonised mechanism of the watch, cased in 18K white gold. The modernity of the JCAM09 hand-wound tourbillon caliber strikes a contrast to the piece’s overall vintage design. The watch features hand-finished angles to its drawn flanks, sand-blasted mechanism, and is equipped with a 72-hour power reserve. This men’s watch measures an imposing 58 by 47.5mm, with a sapphire crystal and sapphire caseback. For more on this watch or to explore other luxurious creations from Jacob & Co. visit their website. Another recently released opulent timepiece is the The Fascination by Graff Diamonds, which incorporates 152.96 carats of white diamonds. It is the world’s most valuable transformable timepiece. Read all about it by clicking here. Tagged LifeSpice, Luxurious lifestyles, Luxurious watches, Luxury watches, Sartorial Notes. Bookmark the permalink.